For as long as I can remember, the summer solstice has made me feel a tiny bit melancholy. Which seems to make no sense at all for someone who loves swimming and watermelon and baseball and zinnias and long sultry afternoons. But it’s because I love all those things that I can’t help but be a little sad on the day that reminds us that, even with high summer still ahead, we’ve pulled into the tunnel leading to winter. To try to overcome such feelings, I accepted an invitation from a group of wild-and-crazy friends to celebrate last Monday’s solstice in a new way. We’d meet at four o’clock in the morning to drive to Cumberland County, where we’d hike to the overlook on the Black Mountain loop trail. Once there, we’d settle onto the gigantic flat rock that towers above the Tennessee Valley and wait for the sun to come up. It became even cooler when we realized that the moon would officially become full that morning and would set in the west just as the sun was rising in the east. By the time we arrived at the Black Mountain parking area, dawn had lightened the sky enough that we didn’t need flashlights to follow the trail. The forest was still shrouded in gray. Birds were tuning up but not singing yet and the air was surprisingly chilly. We followed the trail signs and, before long, crossed a footbridge spanning a deep crevasse. Straight ahead was the overlook, glowing in the moonlight. Thermal mugs of coffee in hand, we waited for the show to start. And what a show it was. The sky glowed pink. Then yellow-orange. And up popped the sun, bursting with the gift of fifteen hours of daylight on this longest day of the year. Down went the moon. Below us were Grassy Cove, Watts Bar Lake and—in the distance—the Great Smoky Mountains. We sat on that flat rock for a long time, soaking in the wonder of it all, until our stomachs began to growl. Reluctantly, we headed back down the trail and made discoveries—including a beautiful stone chimney and a rock spring house—that we hadn’t noticed in the semi-darkness on the way up. Our breakfast destination was Liberty Market in Crab Orchard, where we feasted on hot biscuits–piled high with anything you could ever dream of putting on a biscuit–and the most delicious coffee I’ve ever tasted. Then we went our separate ways, agreeing to gather again at suppertime for the second part of the celebration. The meeting place was the Sonic in Sparta, which showed appropriate respect for the solstice by offering half-price cheeseburgers all day on June 20. 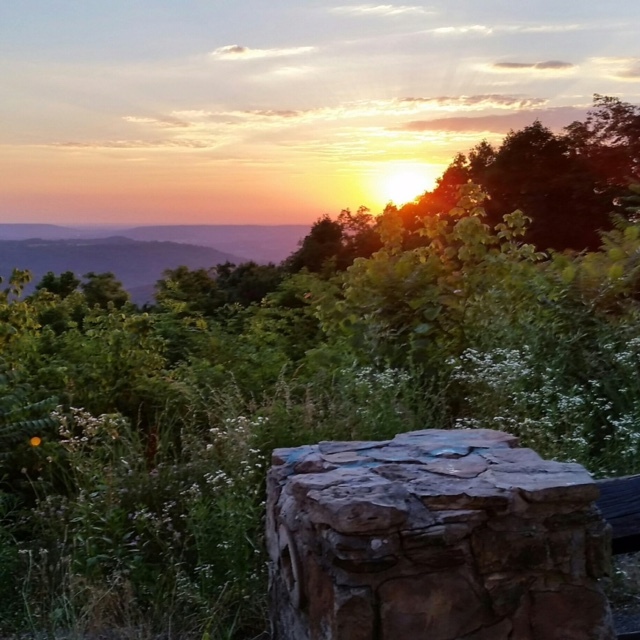 With sacks stuffed full of burgers and onion rings, we headed six miles up Bon Air Mountain on Highway 70 to the scenic overlook known to locals as Sunset Rock. Those with pickup trucks perched on tailgates. Others sat on stone pillars that line the edge of the parking lot. At eight o’clock, we clapped and cheered as the sun we’d said hello to so many hours ago dipped below the tree line. Then we hightailed it to a quiet road near the capped-off Corolla coal mine to watch the enormous strawberry moon rise above a hayfield. I’m not ashamed to admit I cried when that moon slipped up over the horizon. Not just because it was the most beautiful moon I’d ever seen, which it was, but because it made for a picture-perfect ending to a picture-perfect day. A day that, this year anyway, didn’t make me feel melancholy at all.